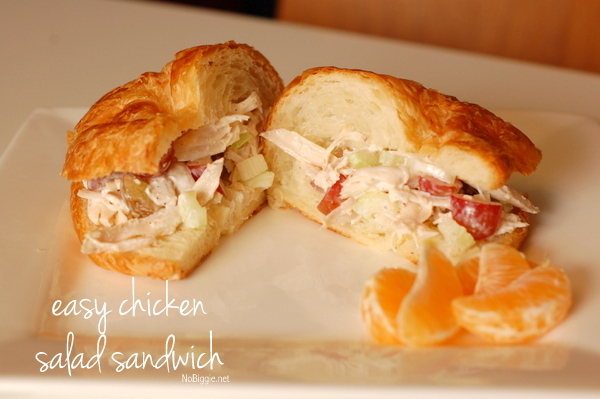 The easiest chicken salad sandwich there is…made with rotisserie chicken, it comes together in a snap. If you love to pick up a rotisserie at Costco, then you might as well pick up a dozen croissants. Those two just go hand in hand. The croissants at Costco are so good, and so big (but what isn’t big at Costco?). 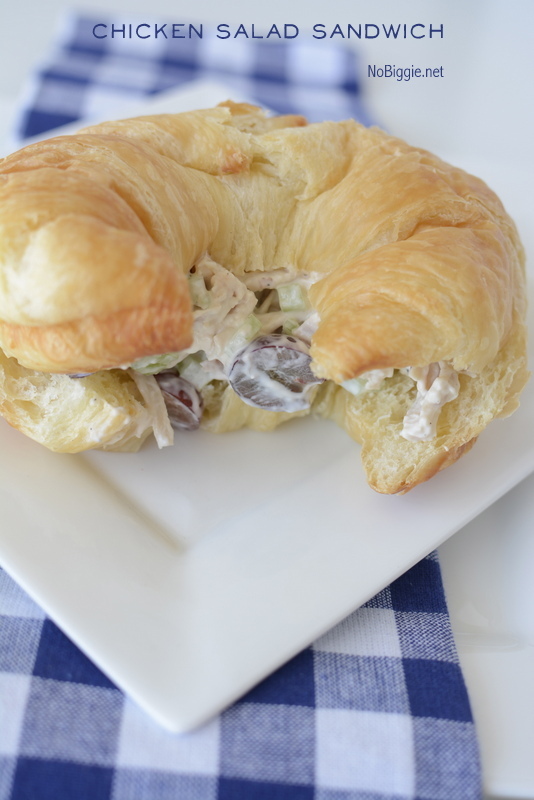 Chicken Salad Sandwich makes for such a good lunch, don’t you think? Mix together and served on a big buttery croissant. yum. 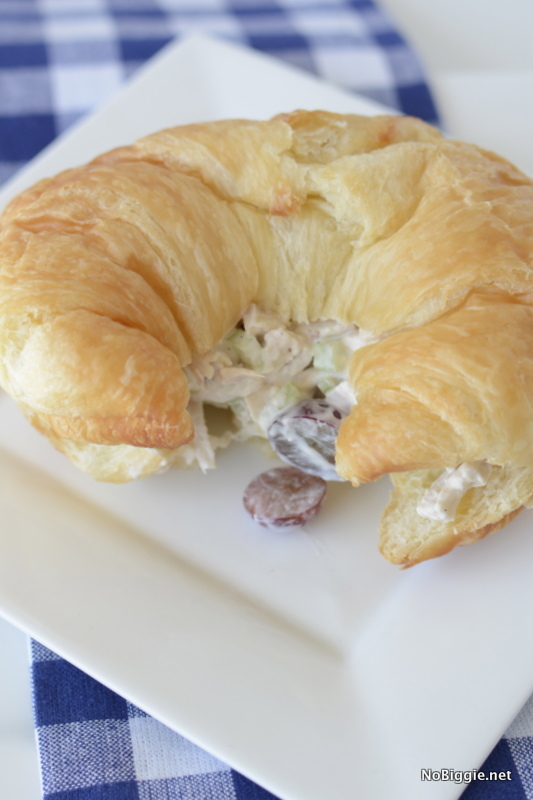 You can't go wrong with a delicious chicken salad served up on a buttery flaky croissant. In a large bowl add all ingredients except for the croissants and toss until all is coated in the lemon juice mayo. Slice a croissant in half and fill it with this mixture. Serve with fruit and chips on the side. If you have any leftover croissants, you have to make this Croissant Bread Pudding! It’s the best!! Red grapes are a MUST in chicken salad. Mmm. Now I'm craving this for lunch! I've been drooling all week! Thanks for the recipes! OH my. I love this meal. 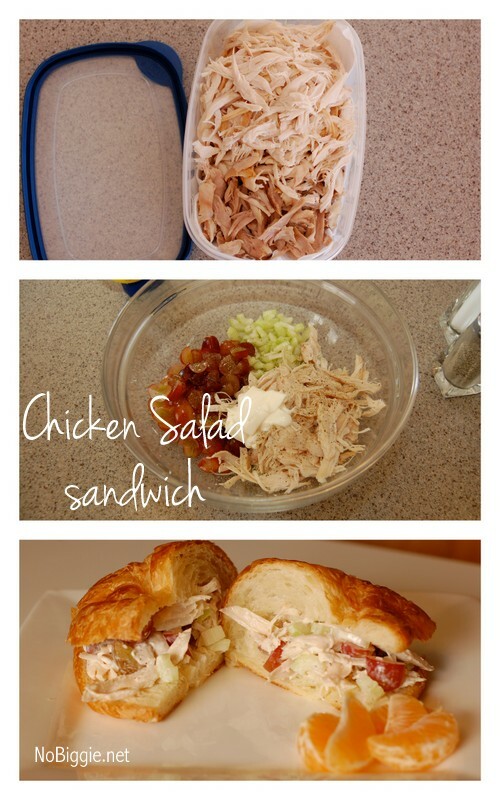 Seriously the best thing hands down that you can do with rotisserie chicken! Thanks for sharing. I want to try out all of your rotisserie chicken recipes. They look so yummy! My favorite! And to make it even easier, I buy the chicken salad at Costco that they made with their rotisserie chickens, then add grapes and cashews. that's the way i like it too…nice and simple. K- now I'm hungry. You know what would be even better? If you cooked it all for me. Now THAT would be awesome. Just think about it for a bit…. O.K. Now this is torture… I'm sitting here eating Mickey Mouse chicken nuggets and wishing I had some real food like that. I'm for sure going to try those! Thatcher's favorite. For me, it's all about the pepper! Y-U-M. Now I'll have an excuse to buy those croissants. It's for Chicken! P.S. I could eat the entire box full of them all on their own. Just wanted to say thank you so much for this. Came over on a link from Make and Takes at just the right time. I wanted to try to cook all of our meat for the week ahead of time and these recipes are awesome!